Spazju Kreattiv is presenting a co-production with young writer Anton Saliba and director Bettina Paris from tomorrow to Sunday. 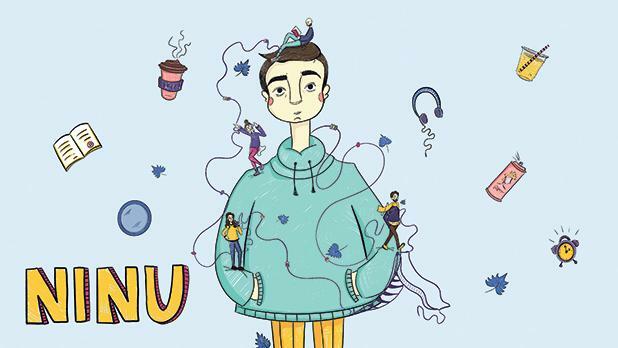 Although Ninu is an original piece in Maltese aimed at adolescents, it is the kind of work that will also be appreciated by adults, due to the current, relevant and realistic themes tackled. Ninu follows the coming-of-age story of a young boy who goes by the same name, throughout his journey towards adulthood. In an ever more connected and globalised society, he struggles in his search for identity and purpose, which fuels his overwhelming anxiety and threatens to destroy everything that was once dear to him. How much is he willing to sacrifice to fit in and feel connected to the world he lives in? The show explores the complexities of growing up, the pressures placed on us by society and their effect on our mental health. The creatives behind this production are two young Maltese actors who are active in the theatre scene not only locally but also abroad. Saliba, the author and one of the actors, is based in London, where he recently graduated in theatre. Ninu will be his playwrighting debut. The director, Bettina Paris, has also been trained in theatre both locally and abroad and has had the opportunity to work with the esteemed Chickenshed. The cast is made up of a group of Maltese youths synonymous with Teatru Manoel Youth Theatre and also very active in local and foreign theatre productions. The preparations for Ninu have been part of a planned vision projected on multiple levels. In fact, the script has been in the works for the past year, evolving along the way through research and a number of meetings with consultants and experts in the field of psychology and mental health. Moreover, an exclusive work-in-progress version of the production was performed during ŻiguŻajg 2018, where festival delegates and other industry experts provided the team with feedback and criticism. Ninu is a co-production with Spazju Kreattiv, in collaboration with ŻiguŻajg International Arts Festival for Children and Young People. It is supported by the Arts Council Malta – Malta Arts Fund. Performances at Spazju Kreattiv will be held tomorrow and on Saturday at 8pm and on Sunday at 2 and 6pm. For tickets, visit https://ticketenginex.kreattivita.org/ or call 2122 3200. A post-show discussion focusing on the creative process behind this original piece for teens, the element of mentoring and bringing the text to life in all aspects of production will be held on Sunday between 7 and 8pm. The discussion will be moderated by Stephanie Bonnici and Clare Azzopardi will be among the panel members.